Three Design Communications students entered the American Advertising Federation’s 2016 Regional Student Addy Awards and won three awards Wednesday night (Feb. 24). 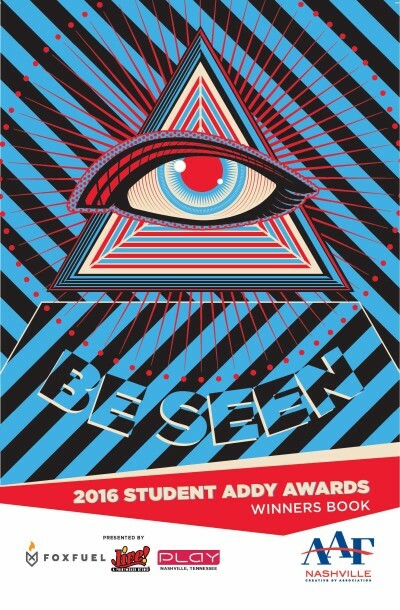 Grant Gill won a Silver Addy for his Poster Design that was used as the promotional announcement for this year’s event. Caitlyn Marsh won a Gold Addy in App Design and a Silver Addy in Packaging Design. Marsh has accepted employment at Red Pepper, a local marketing, design and advertising agency. Grant Gill and another design major, Samantha Cuthbert, developed the promotional materials for this year’s event. Cuthbert was awarded an internship with GS&F Advertising Agency when their submission was selected. Gill graduates in the spring of 2016 and is currently stepping through the admissions process at the University of Oxford. Gold medal winning work moves on to the District competition. This is the fifth year in a row that Belmont Design Students have entered and been recognized.